Beautiful pictures are my first attraction to a dish. It's why I subscribe to more food magazines than I know what to do with and why I continue to buy cookbooks when I have 30 at home that haven't had more than one or two recipes made out of them. I'm a sucker for food photography. It's why, when I was reading the latest issue of Donna Hay, I immediately knew I had to make their salt cured salmon. The beautiful pink flesh contrasted with the green of the dill made an amazing picture and since salmon is my favorite fish, this was a sure bet. The recipe is very simple and I think the biggest secret was splurging on a beautiful piece of fresh salmon from my local fish monger. Not cheap, but worth it for this dish. I got home from the fish monger and within just ten minutes, had the fish curing in the fridge for brunch the next day. Then it was time to head off to Surfas, a restaurant supply store in Culver City. Heaven on earth for someone like me. I'm there pretty much every other week and am always spending more money than planned. When I got to Surfas, I was pleasantly surprised to see that they had installed a cheese and charcuterie counter. When I realized that the person working the counter was a friend of mine, surprise turned to elation, followed quickly by a sense of loss for the recent progress on my workout routine and healthy eating. I knew having David as the gatekeeper to this wonderful world of cheese would be a blessing and a curse in my life. Mostly blessing, but there would be consequences, and mostly in the area of my clothes not fitting properly. I spent the next fifteen minutes tasting different cheeses and talking about everything that David had available. I left with a great selection (after heading in with no intention to buy or having any specific need for cheese) and amongst that selection was a beautiful chunk of aged gouda called Beemster Classic. It's delicious and smooth with little crystals that crunch in the back of your mouth as you chew. We all agreed that if ever there was a breakfast cheese, this was it. I was excited knowing that I had the perfect dish, curing at home, that desperately needed a delicious cheese to go with it. To cure the salmon use this simple recipe that I'm borrowing from Donna Hay. I cut the recipe since I'm only cooking for two, but this can easily be doubled to serve more. Smoked salmon is a tradition at my house on Christmas morning, but this year I think we'll be curing ours at home. Coat salmon in chopped dill. Stir together salt, peppercorns, sugar and water. Place half the salt mixture on a piece of plastic wrap, place the salmon on top of the salt and coat the top and sides of the salmon with the remaining salt mixture. 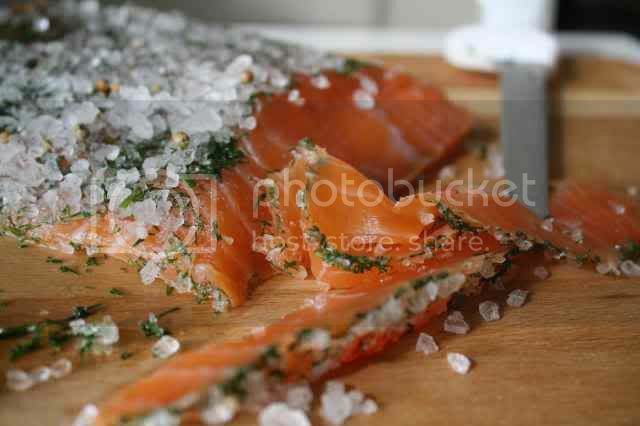 Wrap tightly in the plastic wrap and place in a rimmed baking dish (the salmon will give off a good amount of liquid). Place another dish on top of the salmon and weigh down with a few cans of food. Refrigerate for 24 hours. Remove from the plastic wrap and wipe off the salt. Slice thinly and serve with the following recipe or as desired. Heat a small pot of water to poach the eggs. When the water is almost simmering, add the vinegar and swirl the water in a circular motion. Add one egg and cook for 3 - 4 minutes. Remove with a slotted spoon to drain on paper towels and repeat with the second egg. Toast and butter the bread. 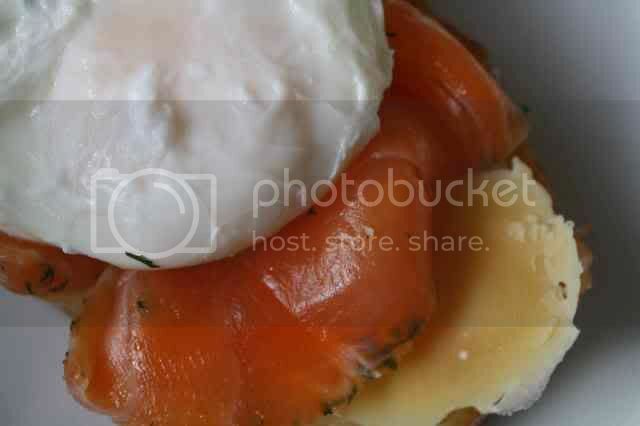 Layer the Beemster, salt cured salmon and finally the poached egg on the toast and enjoy! Who knew making cured salmon at home was so easy? I love it! Wow..this sounds like a great project for the holiday days off. Thanks! The pictures sent me into a culinary frenzy! That use for Beemster is an inspired layering of contrasting sweet, creamy, tangy and salty. Your salmon looks wonderful! We also make our own--very similar. What I want to know is what camera do you use to get such fantastic pictures? The photos are gorgeous and they definitely make me want to give this a try. It looks delicious! The salmon looks really good, great photos! Wow, I never would have thought of curing my own salmon. Looks delicious and not too hard. I'll have to try it! I absolutely love cured salmon! Yours looks great. We like to do a cure with sugar, salt and smoked paprika. We let ours sit for about 3 days in the fridge weighed down with a brick. Thanks for reminding me how delicious home cured salmon is! 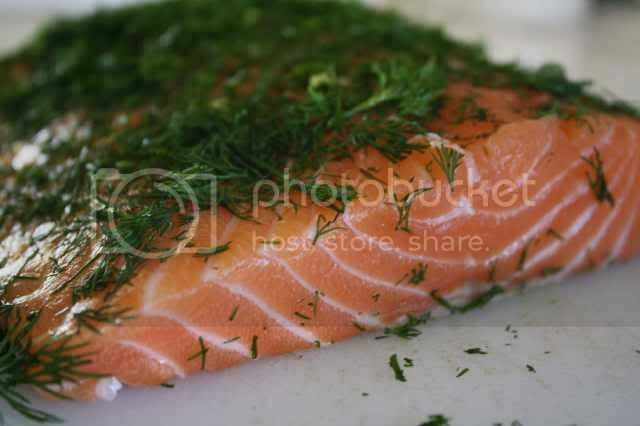 We call this Gravlax in Sweden and have it with a special cold mustard and dill dressing -- heaven on a plate. You might want to freeze your salmon for 72 hours before or after curing. It will kill of any parasites and make it safer to eat. great recipe....made it on sunday and it was a hit!.....how long will this stay for if kept wrapped in fridge? I am going to try this. 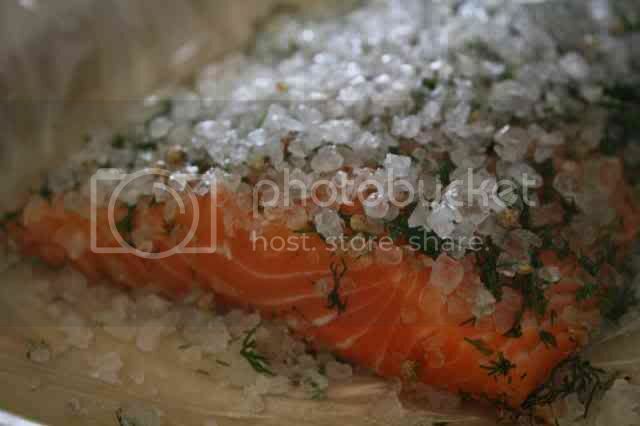 i don't like salmon cooked, but absolutely love it cured, also, thank you for the lovely photos!